Need more information about booking Home 9652914 ? Light and spacious apartment in a modern development in central Northampton. Comfortably furnished and fully equipped apartment comprising of a large open plan lounge/diner/kitchen; spacious balcony; modern kitchen with built in appliances; a family bathroom with bath and one ensuite bathroom with shower; two double bedrooms with wardrobe and storage. Secure underground parking. 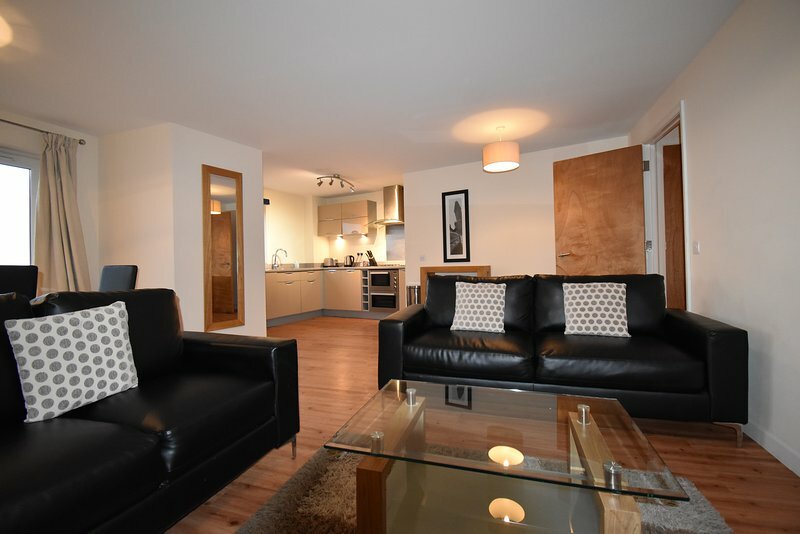 All modern comforts including broadband with Wi-Fi, dishwasher, washer dryer, wide screen TV with Sky, DVD, stereo, plus security entry to the building. minutes to Northampton train station (55 minutes to London); and 50 minutes from Luton Airport. This Apartment has 2 bedrooms, 2 bathrooms and sleeps 4. It’s been listed on Holiday Lettings since 05 Sep 2018. Located in Northamptonshire, the average weekly rate is £922.